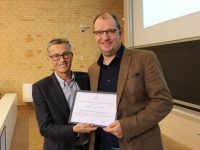 Aarhus, September 29, 2018 – EUPRERA has named Prof. Dr. Ansgar Zerfass, from Leipzig University in Germany, a “Distinguished Public Relations Scholar”. The lifetime award recognizes his outstanding contribution to research and education in public relations as a social science discipline on an international level. He was awarded today at the Aarhus University, on the occasion of the EUPRERA annual congress, by the association’s president Professor Dr. Ralph Tench. There’s a long tourist tradition in most of our countries of selling ‘sticks of rock’ (candy) from a holiday destination. Particularly a tradition in seaside resorts. Candy like this often has the name of the town or location written inside. And some people by their loyalty to a place, issue or idea are sometimes compared to a stick of rock. Cut them through and they will say Real Madrid, Aarhus, Save the Planet. For this year’s Distinguished Scholar I believe this is true. If we cut them in two inside it would read EUPRERA. They have been a loyal, hard-working and dedicated member of the Board of Directors, President and Past President as well as a driving force behind some of the most high-profile initiatives for members and the Association worldwide. In fact, if we cut them through it would say two words: EUPRERA and ECM (the European Communication Monitor). Yes, no prizes for guessing the member we would like to acknowledge today is our good friend and colleague, Professor Ansgar Zerfass from the University of Leipzig Germany. Ansgar is originally from the North Rhineland. He studied Economics and Communication Science at the University of Erlangen-Nurnberg. He continued at the University completing his PhD: Business management and public relations: Foundation of a corporate communication theory and public relations. From 1996 he worked in communication practice as communication leader at MFG, a Public Innovation Agency for IT and Media of the German federal state of Baden-Württemberg. And in 2000 he became the director of MFG. 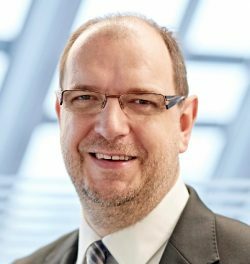 In 2006 he got his habilitation from the University of Erlangen-Nürnberg in Communication Science and in the same year he got his call from Leipzig University as Prof. for communication management. In 2013 he was appointed Prof. for Communication and Leadership @BI, and 2014 Prof. for strategic communication. As we know from past congress many of his students have won prizes for master and bachelor thesis. On top of all of this Ansgar is known as a prolific journal editor, book author and frequent journal author. At conferences he is an ever present in sessions and presenting and chairing panels. Sometimes in the two or three rooms at the same time! But for many Ansgar is best known for his commitment and dedication to the ECM. A project that has benefited EUPRERA and its members for over 12 years. Those of us in the ECM team fully acknowledge Ansgar’s energy and focus for this project which has grown to include now a Global Monitor covering Europe, Latin America, Asia Pacific and now North America. Aarhus, September 29, 2018 – EUPRERA, the Public Relations and Communications Association (PRCA) and the International Communications Consultancy Organisation (ICCO) have awarded two master students for their excellent theses in strategic communication at the EUPRERA annual congress in Aarhus on September 29. The congress is known as the major gathering of scholars and professionals interested in advancing the profession of public relations and corporate communications on the continent, hosted this year by Aarhus University in Denmark. Theoretical Impact Award – “Value Creation through Thought Leadership. Theoretical fundamentals and empirical framework” by Luisa Bißwanger. Tutor: Ansgar Zerfass, University of Leipzig, Germany. Where CCOs actually succeed in assuming higher-level strategic roles within their organizations, they can be found to take up responsibility within important change and innovation processes, helping to shape the long-term development of their organizations by providing thought leadership. But what is thought leadership and how does the concept fit with established concepts in corporate communications? In her thesis, Luisa Bißwanger develops a focused theoretical argument on how thought leadership supports organizational success. The jurors were convinced of three main strengths of the thesis: (1) the addressing of a highly current and relevant topic, (2) a both focused and ambitious theory chapter, and (3) a well-fitted empirical approach. By combining a communication management perspective with a specific focus on agenda setting, Luisa Bißwanger chooses a promising theoretical approach at the interface between management studies and communication studies. The jurors were impressed with the authors’ ambitions to develop her own conceptual model, based on an engaging and knowledgeable theoretical discussion of the relationship between thought leadership and communication value. Overall, the jury congratulates Luisa Bißwanger to an ambitious thesis, that focuses on and discusses a highly interesting topic, suggests new theoretical pathways and, not least, makes some important suggestions in the direction of communication professionals that provide new arguments towards the value of communication for organizations. Practical Impact Award – “Towards a Lobbying Regulation – A comparative study on the efforts to implement a lobby register in the Republic of Ireland and the Federal Republic of Germany” by Lisa Grimmeiss. Tutor: Tom Clonan, Dublin Institute of Technology, Ireland. In her thesis, Lisa Grimmeiss explores why the efforts to implement a statutory register for lobbyists were successful in Ireland, whereas all attempts to introduce a mandatory regulation for lobbyists in Germany have failed so far. This question is addressed by looking at both structural and institutional factors as well as at actual policy networks of actors adjacent to the proposition of these lobbying registers. The Jury has found that the very idea of transparency of lobbying is truly important and to understand the actual differences between the systems in different countries is highly relevant to our understanding of the lobbying practice in Europe. Furthermore, the Jury has not only found the methodological approach to be well-chosen and relevant but was impressed with the thesis’ clear structure as well as the very transparent attempted to apply its theoretical frameworks. Commenting on the empirical part, the jurors stressed that the project management appears to have been outstanding, that the initiative in securing an elite sample for the interviews is very impressive, and this was triangulated very sensibly with documentary analysis. 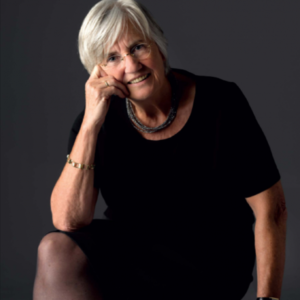 Overall, the jurors applaud Lisa Grimmeiss for an outstanding academic work that is both disciplined and creative and which findings contribute to the advancement of very current research interests within public relations research. Out of 19 applications from 11 different countries, the Jury, together with a panel of 24 expert reviewers, selected nine finalists for the Master Thesis Award for Excellence: three in the theoretical category and six in the practical one. The EUPRERA BoD, the award coordinator Alexander Buhmann and the jurors congratulate these promising graduates on the outstanding academic work done so far. Winners of each category will be announced during the EUPRERA Congress in Aarhus, on September 29. 2018. The Master Thesis Award for Excellence, run since 1995, is a celebration of PR academia and of the role performed by European Higher Education Institutions in the evolution of knowledge of this field. 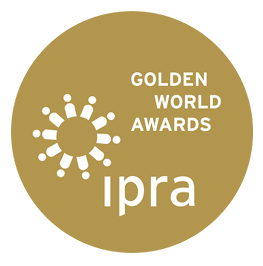 With this award, EUPRERA together with PRCA (Public Relations and Communications Association) and ICCO (International Communications Consultancy Organisation) want to honour and reward Master theses (MSc, MA and MPhil) that make a significant professional/practical or academic contribution to the field of Public Relations in Europe. Are you ready for an unforgettable experience in the nordic waters? While building up the paper sessions combining 80 selected contributions, this year’s congress organisers already planned a unique competition in the early morning of the second congress day: the Best Viking Award! 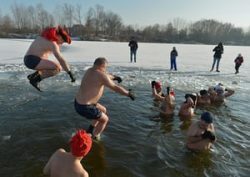 After one minute in the cold water, it’s ensured that you will be full of energy – and big ideas! The Institute for PR sponsors three awards, traditionally awarded at the Annual Distinguished Lecture Dinner in November each year. 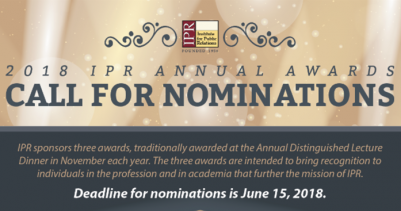 The three awards are intended to bring recognition to individuals in the profession and in the academia that further the mission of the Institute of PR. 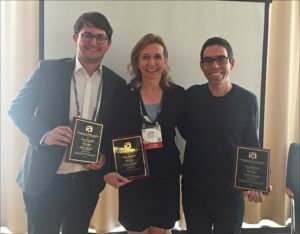 Congratulations also to Diana Ingenhoff together with Elad Segev and Jérôme Chariatte who deserved the Top Faculty Best Paper Award with the paper The Country and its Objectives Mirrored Between Attitudes and Information Searches in a Cross-National Comparison! PR News has announced the finalists for the 2018 Social Media Awards, an annual program that highlights the best social media teams, digital leaders and social media campaigns. 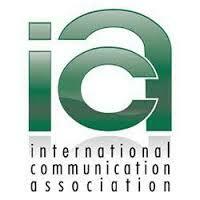 Social Media Award winners and honorable mentions will be celebrated at the Luncheon on May 23, in New York City.